The wine world would be a better place if more Australians appreciated wines like this. Flowers would smell even sweeter. Birds would tweet even more beautifully. Everything would be greater. Yet, still we wait for the Riesling revolution. Waiting. Drinking. Waiting. It’s going to happen! Yeah and so is Christmas (oh wait). Anyway, this comes from a rubbish vintage in the Eden Valley – a year that botrytis was rampant in red grapes, and even the whites can show a bit of rot. 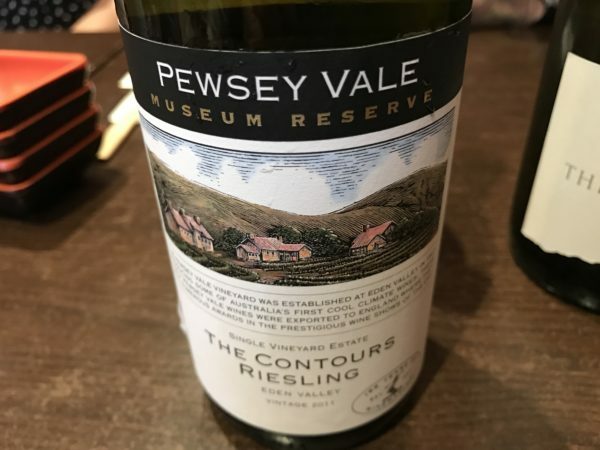 This Contours Riesling, however, is clean and crisp, almost delicate and shy -which is unusual for the Contours – though that could be as much a development phase as anything else. The real joy here is the fine contrast between lemon toast bottle age richness and driving, limey acidity. Like a chameleon, this changes every time you look at it sometimes looking thicker, other times lean and very dry. Toast. Lime. Toast. Lime. Lime (and acid) is winning for the moment, but just watching (and tasting) is the real pleasure, the intensity and conviction through the finish a stamp of pure quality. Personally, I’d prefer to give this a few more years as there’s clearly more to come (and that’s reflected in the score). But right now, this gives much pleasure. And the notion that an aged white wine, from a famed vineyard, can be just $36/bottle really needs to be mentioned over and over again. Best drinking: 2017-2030+. 18/20, 93/100+. 11.5%, $36. Would I buy it? Absolutely.